Copyright Elaine Luther 2011. All rights reserved. 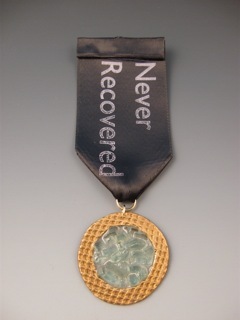 This is a series of “medals you wouldn’t want to earn” that I began in 2006. There are currently 5 medals in the series. The title of the piece is “Why Johnny I Hardly Knew Ye,” a reference to the Civil War Era Song. The sheet music I have of it calls it an Irish folk song and it was arranged by Alice Parker. “When goin’ the road to sweet Athy, Huroo! Huroo! When goin’ the road to sweet Athy, Huroo! Huroo! When goin’ the road to sweet Athy, a stick in my hand and drop in my eye, a doleful damsel I heard cry: Johnny, I hardly knew ye. With your drums and guns and guns and drums, Huroo! Huroo! Hearing it in a choral performance is amazing, it’s a powerful and haunting song. 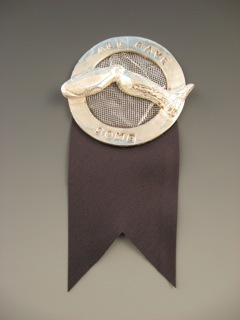 Materials: Precious Metal Clay (fine silver), fine silver mesh and black ribbon. Ah, there it was. The two inspirations would come together. Bronze, because of the military Bronze Star, for those wounded in battle. So this is a medal for Corey. And for anyone else, broken by life. Recognition that most everyone has something from which they have never recovered. 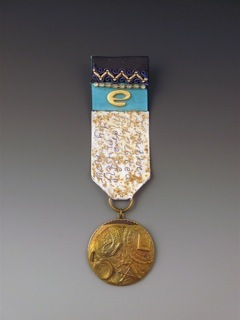 Materials: bronze, epoxy, broken automotive glass, ribbon silkscreened by the artist. I was interviewed about this piece in Studio PMC by Suzanne Wade* and probably spoke most eloquently about it then. Briefly, about the origins of the piece. 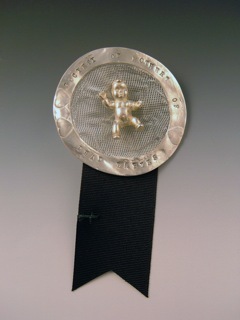 There was a call for entries that Tim McCreight wrote for a show called “Secret Identities.” I designed this medal, in the form inspired by a Jewish mourning pin, in response to that call because anyone who had met me more recently didn’t know that I was a mother who had lost a baby, hence, my secret identity. Only later did I realize that the call for art was for a Secret Identity that you wished you had. So I didn’t enter this piece in that call, but the call inspired this piece, and in turn, the whole series. 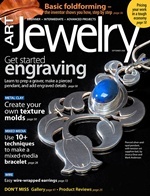 *Here’s the link to that article, in the Summer 2006 issue of Studio PMC. Funny how life changes. 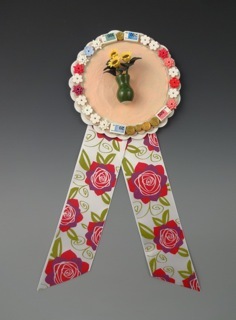 These medals now span the range from profound to the mundane. This newest one could be #firstworld problems. I made it to express my feelings of longing for fresh flowers: there they are at the grocery store, every time, staring at me. This winter has been especially long and bleak, perhaps that increased my longing even more, but I couldn’t justify the expense. 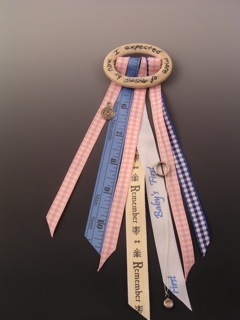 As often happens with these medals, I make them, and then the feeling is released. After making this medal (and its sister medal on the same theme, not yet photographed) I decided that there are other things I buy that aren’t entirely justified. I’ve decided I’ll be buying flowers now and then. Disappointment 2 is a variation on that theme and talks about how I felt at the time, that all I had done was have babies. Once these pieces were done, I released those thoughts and moved on. the show then travelled to the Shaw Gallery in Maine. 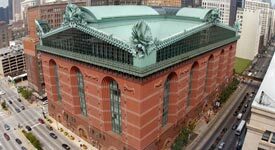 All three medals, plus two more in the series and A Shrine for Sophia (Pocket Shrine) were exhibited in a solo show at the Harold Washington Library in Chicago.